Pan-fried Halloumi or fresh Feta cheese with grapes or fresh melon would be perfect! Sometimes referred to as “the cheese that grills,” Halloumi is traditionally a Cypriot cheese (from Cyprus). It is salty and dense, and it can stand up to grilling and pan-frying. Halloumi is a Mediterranean cheese, and I’ve been doing a lot of Mediterranean thinking lately. Just the other day, as a matter of fact, I posted my recipe for Hummus and Homemade Pita Bread, and by the time you are reading this I’ll be in Baton Rouge at a Lebanese convention. I am not Lebanese, but my wife is. And I have fallen in love with the Lebanese culture, cuisine, and music. The convention is always a fun time with lots of delicious Lebanese foods: hummus, tabbouleh, lamb, grape leaves, fried kibbeh, baked kibbeh, and even kibbeh nayeh (make sure you look that one up!). Oh, and I can’t forget the spinach pies… and the baklava! You really can grill Halloumi cheese. If you are going to grill it, flip it frequently to prevent burning. You can use tongs or a spatula to turn Halloumi on the grill. Some folks prefer to cut the Halloumi into chunks and skewer it together with onions, mushrooms, peppers and tomatoes. Halloumi does very well on kabobs. For this salad, I chose to pan-fry the Halloumi. I sliced it widthwise into roughly half-inch slices. Using a cast-iron skillet on medium heat, I added just a bit of extra-virgin olive oil and fried the slices for about 2 minutes on each side. If you want to leave the olive oil out of the picture, you can. The cheese fries nicely in a dry skillet too, since it gives up some of its brine as it fries. Want to kick-up your pizza notch for a totally new and exotic Mediterranean flavor? Grate the Halloumi on your pizza. Use a Baking Steel to take your homemade pizza-making to a whole new level. You don’t have to do any cooking with the cheese if you don’t want to. Halloumi goes really well with fresh tomatoes, cucumbers, onions, black olives and green peppers. Toss all of that together with a bit of extra-virgin olive oil and fresh lemon (an perhaps a couple of cloves of fresh garlic, crushed), season with salt and pepper, and you’ll have yourself a dynamite salad. Once you have completed all your chopping and dicing, and soaking, you can begin to assemble the tabbouleh. I usually throw together all of the parsley, mint, onion, and green onion into a large glass salad bowl as I chop. I usually dice the tomatoes last and throw them in on top. Add the 1/2 cup of extra-virgin olive oil and lemon juice to the bowl and mix well. It’s best to go slow. This is one of those “you gotta eyeball it” recipes. There are lots of variables: the size of the bunches of parsley, the size of the bunch of green onions, etc. It takes practice (and lots of tasting!) to get it just right. So go slow on the olive oil and the lemon juice. Then season with salt and cayenne to taste. Slice the Halloumi widthwise into roughly half-inch slices. Using a cast-iron skillet on medium heat, add just a bit of extra-virgin olive oil and fry the slices for about 2 minutes on each side. If you want to leave the olive oil out of the picture, you can. The cheese will fry nicely in a dry skillet since it gives up some of its brine as it fries. Serve on plates, using the inner leaves of Romaine as a bowl for the tabbouleh. Top with a slice of Halloumi cheese, and garnish with a sprig of fresh mint. It’s a Cheesy #SundaySupper Today! Some say that the moon is made out of cheese. 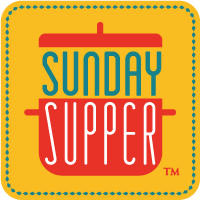 I don’t know if that is true or not, but I do know that we have some really delicious recipes featuring cheese this week for #SundaySupper! Visit my friends… And tell ’em I sent you!